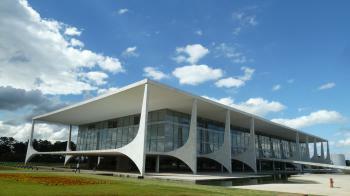 Brasilia is one of the major examples of the 20th century´s modern movement in architecture and urban planning. The city officially became Brazil´s capital on April, 1960. Four years before, it didn´t even exist. At that time, President Juscelino Kubitschek commisioned Lucio Costa (urban planner), Oscar Niemeyer (architect) and Burle Marx (landscape architect) to build a new city from scratch. Lucio Costa drew the Plano Piloto, in which Brasilia is shaped like an airplane (or a bird). There´s a wide north-south axis for transportation. Around this are the residential zones, divided into blocks, each with its own churches, shops, schools etc. 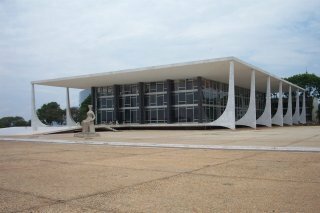 At the tip of the east-west axis there are formidable government buildings, like the Congress and the Itamaraty Palace. The city was planned for 500.000 to 700.000 people. More would have to live in sattelite cities, which are abundant now because of Brasilia´s 2 million population. This is a strange city, that cannot be compared to any other in Brazil (or the rest of the world). To be honest: the first thing that came to my mind was that they dropped an atomic bomb here. It must have happened in the early 1970´s, in a Bucharest-like city. The people are slowly starting to return now, occasionally you see one or two moving about the fields. To see some of the architecture, I joined a 3-hour bustour. We visited 9 places of interest. The most impressive I found the Sanctuario Dom Bosco. 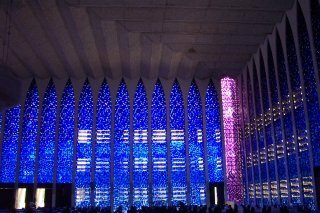 When you step inside this church, you´re surrounded by a blue light shining through the many glass-tiled windows. The other buildings are a lot more sober. Some beautiful in their simplicity (like the Church of Our Lady of Fatima), others quite depressing (like the highrise buildings that were built for the ministries). In August 2018, I visited Brasília. The city is particularly inhospitable to pedestrians, so I engaged a local guide with a car, Juan Luis Hermida (contato@guiajuanluishermida.com.br), one of the best I have ever encountered. Atheist Oscar Niemeyer achieved the apotheosis of his nearly eight-decade architectural career with the Cathedral of Brasília, which was completed in 1970, a dozen years after its cornerstone was laid in 1958. In 1990, the cathedral’s outer roof was lined with stained glass, now filling the ineffable place of worship with color and light, where the nave is overlooked by three angelic statues. The city was created on a grand scale, more for automobiles than pedestrians, so the streets and plazas were generally devoid of people, except for a few protesters in front of the Palace of the Supreme Court calling for the release of Lula, the former president, from prison so he can run in the election scheduled for October 2018. Some people will hate Brasilia, but I am unapologetically going to state I thought it was awesome. Brasilia contains some of the finest buildings I have ever visited, and in the Planalto Palace (for exterior) and the Itamaraty Palace (for interior) perhaps the two most beautiful I have ever seen. I was originally going to qualify that by saying "most beautiful modernist building" but I really can't think of any other buildings I have thought to be more perfect. The clear simple elegance of the forms is then enhanced by playful, almost baroque flourishes such as the flared columns or exquisite spiral staircase. As a fan of modernist architecture and especially of Oscar Niemeyer's work I am predisposed to liking this site, throw in that it was my first South American WHS, my personal site visit 250, and that I have a couple of politics degrees to give context to the buildings, then things were very much stacked in favour of a tour around the Brazilian capital. However even my high expectations were surpassed, the fact that the majority of them were open and welcoming on free guided tours really added to our enjoyment. Now I fully appreciate not everyone will share my enthusiasm for the work of Oscar Niemeyer, nor be as able to gloss over some of Brasilia’s failings. However the sheer quantity of world class structures in one city will hopefully entertain even those not fully enthralled by minimalist repetition. The one thing that came as a surprise was how nice the residential aspects of the city felt, (I admit I had already mentally drafted a section on the failure of the urban plan and its lack of thought for human inhabitants). We went off to explore the southern wing on our first night, making use of the new metro system. The large housing blocks seemed very welcoming and came with lots of communal resources in their immediate surroundings. Then we started to get an idea of how everyday life worked. Every few blocks there were high streets with shops, bars and some surprisingly trendy restaurants, it turns out hipster burger joints are as big here as they are in Kreuzberg, Flagstaff and Brixton. There are some downsides; the big distances, reliance on taxis, grim area between metro station and southern hotel district, most food options being in shopping malls!?! However as the saying doesn't go “Brasilia wasn't built in a day” and hopefully as the city evolves these issues can start to be rectified, the metro line is a good start. I really loved Brasilia, whilst its exceptionally friendly and welcoming population is fighting to humanise its massive scale, the astounding beauty of many of its major buildings is enough for me to put this amongst the best world heritage sites I have visited. Where else in the world you have the executive, legislative and judiciary powers holding office on the same square? It's all happening on the Praca dos tres Poderes in the Brazilian capital. A few meters away is the Itamarati, a marvellous modern building that houses the Ministry of Foreign Affairs.The purpose-built federal capital of Brazil succeeded Rio de Janeiro in 1960, and was laid out by Professor Lucio Costa in the shape of an airplane, with many buildings designed by Brazil's most famous architect, Oscar Niemeyer. All planned, all organized.For instance on Esplanada dos Ministerios, you can find 19 tall ministry buildings where people go to work. The appartment buildings where they live were planned just next door. But the most impressive sites for me were 2 churches: The Sanctuary of Dom Bosco with its multi blue stained glass windows ranging from shades in light blue, to indigo, to marine blue and depending on the day light, it can be an extraordinary atmosphere inside this church; the other one is the Cathedral Metropolitana, a hyperboloid structure,constructed from 16 concrete colums, weighting 90 tons each.Inside you can see 3 aluminium angels suspended from the ceiling; the altar was donated by Pope Paul VI.The capital has been declared a World Heritage site in 1987. Brasilia has very little fancy restaurants, if you imagine that all the embassies are located here. Bar Beirute is a funny place. Middle East cuisine with Brazilian entertainment, its a GLS location and the beer is icecold! On our last day in Brasilia we were lucky: walking towards the Nacional hotel with our luggage, a local guy was hiding in the bushes along the sidewalk.But a police patrol was nearby, and they jumped over in full combat gear, arresting the suspect within seconds. I think the capital is a safe place, as the police knows very well what's going on. I knew next to nothing about it. Built somewhere in the middle of the country. Nor of the heroic artists, nor of the tireless workers. He's accomplished; not even that he's Brazilian! An invitation to visit Brasilia. That it's a place where you feel alive! Impassioned! Of the beautiful brasilienses: gracious, delightful, spontaneous! Bold buildings soar in the brightest of whites! Not shy pastels, but primary colors, making a statement! The Cathedral like hands in prayer holding the miracle within. I know about Brasilia now. I know where it gleams like a dream of a mythical city. I can tell you how to get there. Brasilia is strange place. A planned city, created from nothing when the Brazilian government decided to move the capital inland, in an attempt to develop the interior of the country, Brasilia is in the shape of an airplane and most buildings downtown are built in a modernist style (read white and somewhat spartan looking). 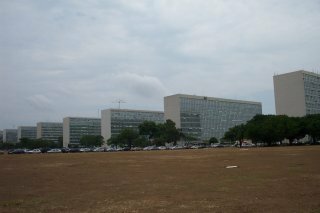 That said, some of the architecture and planning schemes are fascinating and after spending several days in Rio beforehand, Brasilia is like an oasis of calm. The extreme planning of the city, however, prevents it from feeling particularly "lived in" and the great distances between buildings (again based on modernist conception of cities) makes it difficult to get around quickly. Reinforced Concrete: Quote from "History of Reinforced concrete": "Oscar Niemeyer (Brasil) built new capital of the country ? Brasilia ? from reinforced concrete." Modern Urban Planning: Brasilia, a capital created ex nihilo in the centre of the country in 1956, was a landmark in the history of town planning. 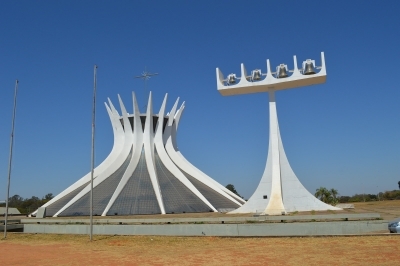 Mathematical Concepts: Cathedral of Brasilia - Hyperboloid of revolution. Hyperbolic of revolution are surfaces generated by rotating a hyperbola around an axis. The shape of the roof of the cathedral is hyperboloid of revolution with asymmetric sections and consists of 16 identical columns. 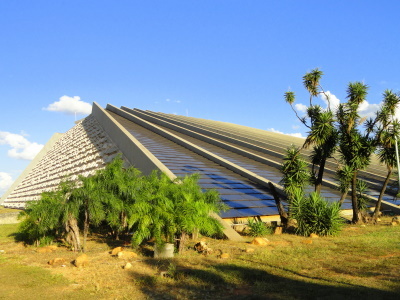 Built in the 20th century: Inaugurated in 1960. Controversial at inscription: It was a city that was barely 30 yrs old when it was inscribed on the list, and several representatives, notably the american delegate, opposed its inscription, " examination of 20th century cities should come after all the traditional historic towns have been examined"
81 Community Members have visited.